Russ and I prefer our tuna served medium-rare. If you like your fish cooked medium, observe the timing for medium-rare, then tent the steaks loosely with foil for 5 minutes before serving. To achieve a nicely grilled exterior and a rare center, it is important to use fish steaks that are at least 1 inch thick. Loosely cover cooking grate with large piece of heavy-duty aluminum foil. Turn all burners to high, cover, and heat grill until very hot, about 15 minutes. Remove foil with tongs and discard; scrape grate clean with grill brush. Lightly dip wad of paper towels in oil; holding wad with tongs, wipe grate. Continue to wipe grate with oiled paper towels, redipping towels in oil between applications, until grate is black and glossy, 5 to 10 times. Grill is ready when you can hold your hand 5 inches above grate for 3 to 4 seconds. 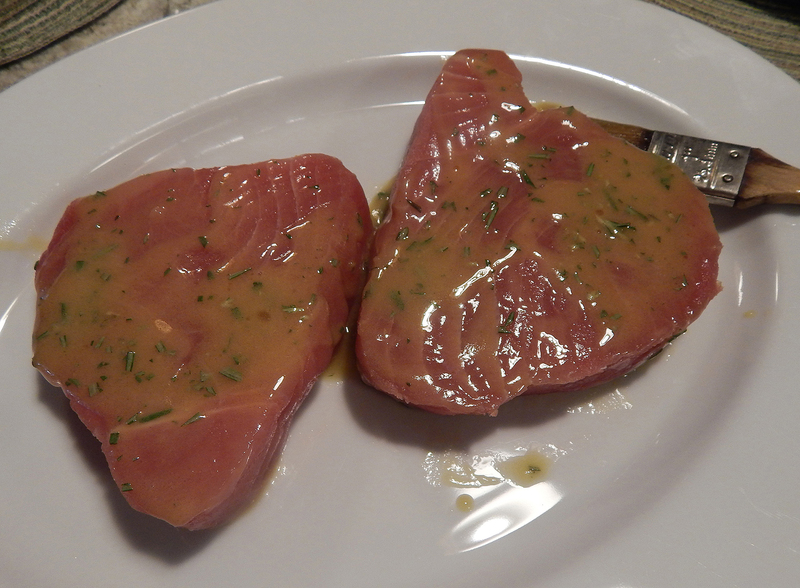 While grill heats, whisk vinegar, ½ teaspoon salt, mustard, honey, and thyme or rosemary together in large bowl. While whisking constantly, slowly drizzle oil into vinegar mixture until lightly thickened and emulsified. Measure out ¾ cup vinaigrette and set aside for cooking fish. Reserve remaining vinaigrette for serving. Brush both sides of fish liberally with vinaigrette and season with salt and pepper to taste. Grill fish with lid down and burners on high without moving until grill marks form and bottom surface is opaque, about 1½ minutes. Carefully flip, cooking until grill marks form on second side, about 1½ minutes longer for rare (opaque at perimeter and translucent red at center when checked with tip of paring knife) or 3 minutes for medium-rare (opaque at perimeter and reddish pink at center). Transfer to large plate and serve immediately, passing reserved vinaigrette. 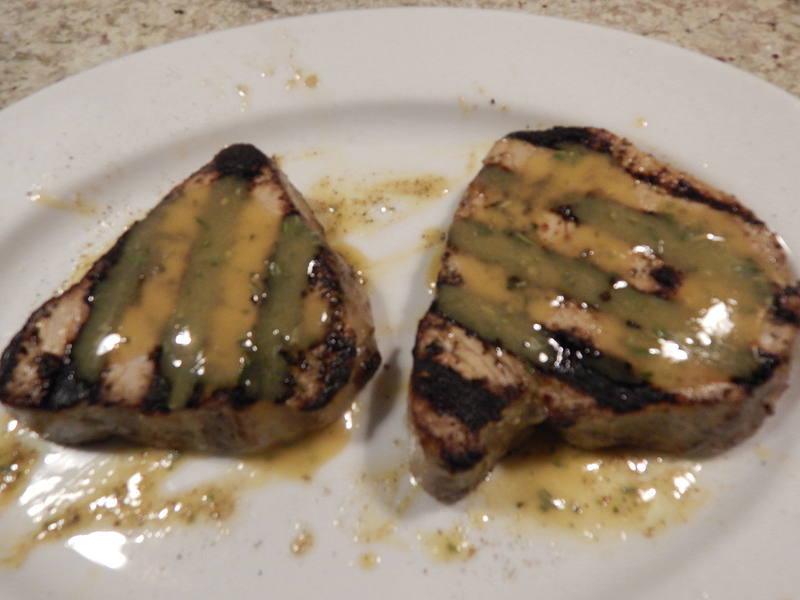 The marinade makes enough for 6 tuna steaks and since we only cooked two, we had a good amount leftover. We’re thinking it might make a tasty drizzle over veggies, or perhaps on grilled chicken. 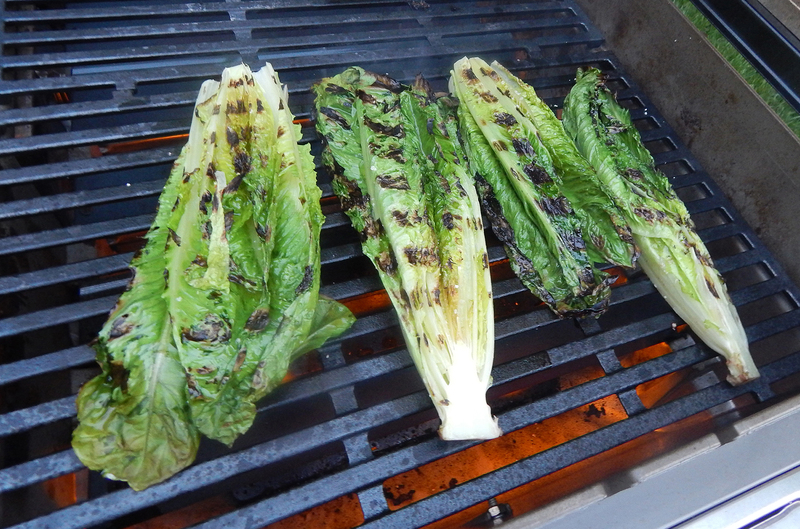 For the grilled hearts of romaine, leave the base stems intact and slice down the middle. Sprinkle both sides lightly with olive oil and add a dash of salt. When the tuna is almost done, lay the lettuce on the hot grill, turning once after a few short minutes – they cook quickly! 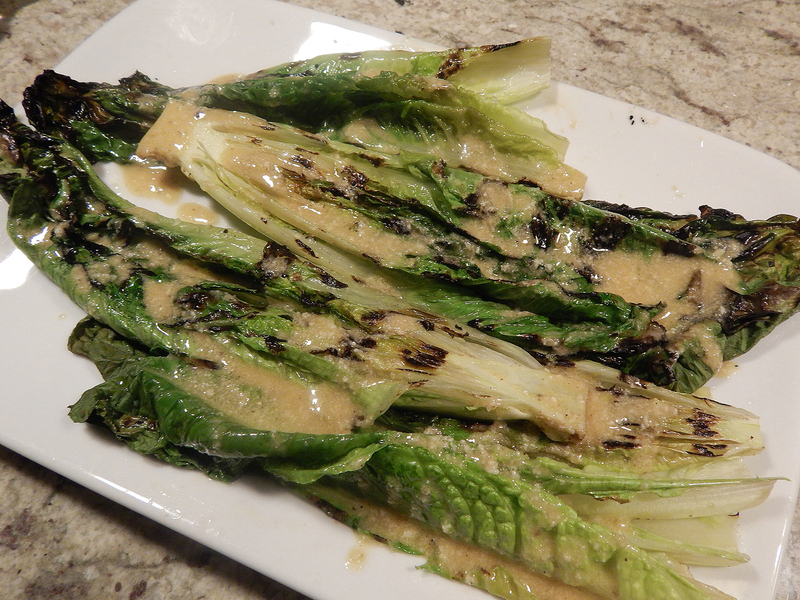 Move to a platter after the lettuce gets some nice char lines and dress with your favorite vinaigrette.